Happy Sky Watch Friday everyone, follow the links to see what bloggers from all over have found to share with us this week. What an amazing photo, I love the reflections! Such wise words to go with this lovely shot! Very beautiful view to harbor,Mandy!I wish I could see such view too.Have a great weekend! Great reflections!! Boom &amp; Gary of the Vermilon River, Canada. 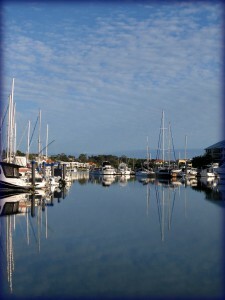 Such a lovely marina scene; the reflections are perfect! The sky speaks tranquility. Terrific shot with the boats lined up beautifully. What a beautiful photo. Love that harbour. Lovely picture =- love the harbour. What a beautiful sentiment!<br /><br />The photo was really perfect for the simple, profound words!